Color glass filters made of SCHOTT optical filter glass are used as optics for many applications in science and industry. The filters became an industrial standard a long time ago. SCHOTT filters are required for various technical applications and also are prevalent in science and research. Our delivery program of optical glass filters which we make by processing raw filter glass material, rolled filter glass sheets, or block glass materials, contains all available optical glass filter materials from SCHOTT. So more than 100 different types of high-quality optical glass filters for various applications are at your constant disposal. In the following, please find the transmission spectra of most of these optical glass filter materials. The color glass filter types marked with "*" have been discontinued. New serial products should not be based on these glass filter materials unless there is a very high volume demand. It is possible that we have some remaining stock of these discontinued optical glass filter materials though. Please send us your inquiry in such cases. Here please find our application for converting optical density to transmission and vice versa. It is a helpful tool that can support you in the selection of the suitable neutral density filter material based on the SCHOTT NG neutral glass filters. 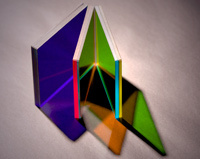 We can fabricate all listed color glass filters to optics for your specific requirements. Additional coatings, cemented filter combinations, assembling of different color glass filters with glass substrates, thermal tempering, or CNC-manufacturing of complex components are possible and part of our daily optics production. Additional optical, thermal, and mechanical material specifications of all colored glass filters are available on request. Use our online SCHOTT-filter calculator for the calculation of the transmittance spectra of all available optical glass filters made of SCHOTT color glass filter material free of charge. Our calculator can compute custom filter transmission curves. You can choose to analyze the internal transmittance or the external transmittance including the surface reflection loss. Zoom to a specified wavelength range or view the full transmission spectrum of the filters.